The modern lifestyle can contribute to unbalanced acidity levels in the body, and health problems. Some of the factors that increase internal acidity and throw-off healthy pH levels include alcohol and caffeine consumption, sugar, wheat, dairy products and a diet that is rich in animal proteins. The acidity levels in the human body, are measured by determining the pH level. 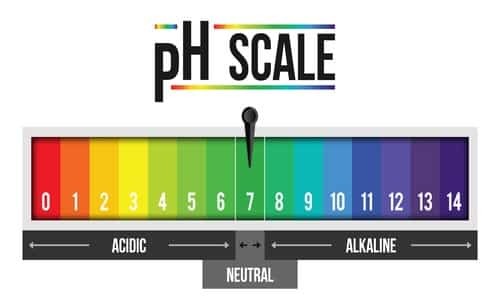 A low pH indicates that there is high acidity (between the levels of 0-6). The optimal pH level for the human body, is scored at a level 7.4, which is neutral. Acidosis occurs when your kidney and lungs cannot regulate the amount of acidity in the blood stream. Impairment of either the kidney or lungs (including inflammation and lung disease), can exacerbate health; and the imbalance can cause significant and even life-threatening conditions. The American Association for Clinical Chemistry (AACC) reports that acidosis as a diagnoses and health concern, begins at a level of 7.35 or lower. There are two types of acidosis; metabolic and respiratory. Individuals with lung disease, chronic respiratory infections or lung cancer can be diagnosed with respiratory acidosis, when the lungs are unable to process carbon dioxide efficiently. Metabolic acidosis occurs when an impairment to kidney function, prevents the effective elimination of acidity from the body, through urine. While health concerns regarding acidosis are known to healthcare professionals, the average person may not fully understand why balancing pH through diet and hydration matters for good health. Part of the problem is that the symptoms of acidosis can be easily mistaken for other transient health conditions, such as fatigue. There is a link between osteoarthritis, joint pain and acidosis. Calcium ions are partially responsible for neutralizing acids within the body. But a prolonged low pH can both exhaust and deplete calcium within the body, producing excessive calcium carbonate which gathers in concentrated amounts, around bone joints, and painful inflammation. Chronic acidosis has been shown to increase the risk of osteoporosis. Respiratory infections are more common with individuals who have acidosis. Bacteria and viral microbes thrive in an acidic environment, and acidity also encourages the growth of fungus, parasites and mold inside the body. If chronic bacterial or viral infections are a concern, talk to your doctor about conducting a pH and blood gas test, to confirm if acidosis is a factor. Individuals with diabetes are predisposed to problems with acidosis. Unregulated blood glucose over average norms, contributes to increased acidity within the blood stream. Too little acidity is also a problem, if pH levels fall within the extreme alkaline ranges of 10-14. This condition is called Alkalosis, and it begins at a level of 7.45 or higher on the pH scale. With higher levels of Alkalosis, other health concerns and risks are identified. Did you know that individuals who have gastrointestinal conditions such as Irritable Bowel Syndrome (IBS) are more prone to Hypokalemic alkalosis? This happens when there is a deficiency of potassium in the diet, or when an individual quickly sheds potassium without restoring minimal levels needed for good health. Kidney disease, chronic diarrhea and even excessive sweating can lead to potassium loss and shift an otherwise healthy pH balance. Untreated and undiagnosed alkalosis can result confusion, difficulty breathing, dizziness and if emergency medical care is not received, extreme cases can lead to coma. The condition is treated with potassium supplements, electrolyte replenishment and a diet rich in fruits and vegetables, and fiber. What choices can you make daily, that can help you achieve a healthy pH level? Some studies have reported that a diet rich in raw, natural berries (blueberries, cranberries and goji) are effective. Reducing alcohol and caffeine consumption, are also effective to help restore a healthy balance. You’ve probably heard that drinking hot water with lemon in the morning, offers a wellness benefit. Did you know that this daily habit can also help balance pH? Hot water with raw apple cider vinegar has also been noted as beneficial by many physicians and dieticians. If you are curious about your own pH balance, visit your local pharmacy for a urine analysis testing kit, and discuss your results or any concerns with your primary care provider.